Sukemune (祐宗) was a smith of the bakumatsu era Yokoyama Bizen School. It is said that he originally came from Ise province and that has studied with Yokoyama Sukeharu (祐春) who was active between Tenpô (1830-1844) and Ansei (1854-1860) and who counted himself as 56th generation Tomonari. However, there is also the tradition that he studied with one of the two generations Yokoyama Sukenaga (祐永). The 1st generation Sukenaga counted himself as 56th, and the 2nd generation as 57th generation Tomonari. However, it is possible that Sukemune learned from all of these Yokoyama Bizen masters. There exists a blade by Sukemune which he made in Keiô three (1867) in the vicinity of the Tenryûgawa (天竜川) in Shinano province, present-day Nagano Prefecture. This blade is signed with the supplement Kômeishi (高鳴子) which seems to have been Sukemune’s gô. Sukemune counted himself as 58th generation Tomonari but so did the Yokoyama Bizen smiths Sukeyoshi (祐義) and Sukekane (祐包). 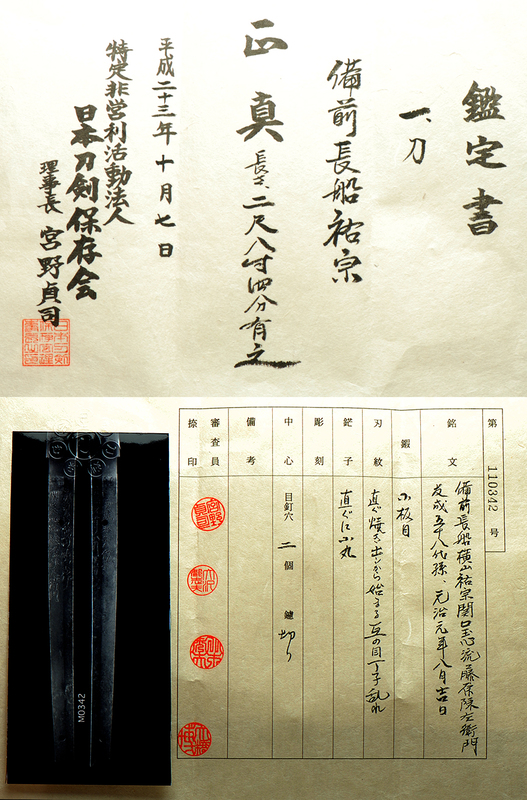 The supplement in the signature says that the blade was made for a certain Fujiwara Jinzaemon (藤原陣左衛門) from the Sekiguchi Gyokushin ryû. Unfortunately, we were not able to find anything on the person Jinzaemon himself. The Sekiguchi Gyokushin ryû is a kenjutsu and iaijutsu school that goes back to Satô Yûta (佐藤雄太) (also listed as Satô Gondayû, 佐藤権太夫) who was a samurai of the Tokushima fief in Awa province who studied kenjutsu with the Heki family which were elders of the Okayama fief of Bizen province. The Sekiguchi Gyokushin ryû was then taught by Satô’s student Okada Yoshisada (岡田義貞, 1826-1896) who was employed as a judô and kenjutsu instructur by Ikeda Masasuke (池田政輔) who was a family member of the Ikeda daimyô of the Okayama fief. Yoshisada established his dôjô Takuseikan (琢成館) in 1886 and was succeeded by his son Yoshitaka (岡田義孝) who died in 1916 at the age of 66. Another Meiji-era instructor of the Sekiguchi Gyokushin ryû was Asakura Takichi (朝倉多吉) whose first name Takichi is sometimes also quoted with the characters (太吉). Asakura’s dôjô was the Kôbukan (講武館), also located in Okayama. Taking all this into consideration, I think that Fujiwara Jinzaemon might have been an Okayama samurai who had his sword made by Sukemune, and who might have trained with Satô Yûta. Reason for this assumption is that Okada himself only started to train with Satô in 1861, i.e. three years before the blade was made, and he did not establish his dôjô before 1886. The Shinto Yokoyama-den was founded by the Osafune school smith Kozuke Daijo Sukesada who made blades with a distinct and rich choji pattern. Next to Kozuke Daijo, the best known Yokoyama kaji is Yokoyama Sukenaga (circa Tenpo). This school made blades of nioi hamon reminiscent of Koto times relying on many varieties of choji. 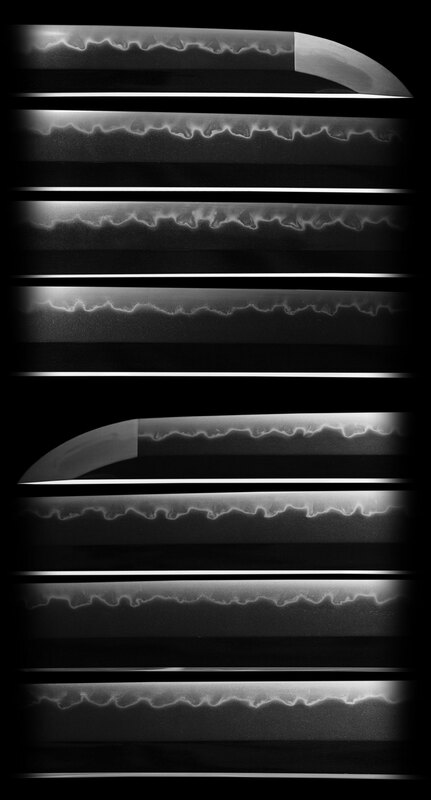 These blades display koshi-hiraki midare, gunome, tight nioi-guchi, sunagashi and kinsuji. Other Shinto and Shin-Shinto era kaji also used the Bizen choji as trademark for their work. Such smiths included Naka Kawachi Kunisuke, Ishido-den, Taikei Naotane, as well as many others. The Shin-Shinto Yokoyama school is best known for the exact nature of its choji-midare, as most Shin-Shinto kaji show a hamon pattern which is restrained and overly conscious. Hamon of a wide and complex choji, koshihiraki-midare; ashi and yo are seen with overall fine ko-nie. Hamon of gunome-choji-midare with juka-choji, ashi, yo and sunagashi being present; koshihiraki-midare is also seen. This is a classic example of the Shinshinto Yokoyama Bizen smiths.The work is composed of beautiful Kobushigata choji-ba. When one scrutinizes the jigane, you will notice a tight ko-mokume hada which was a specialty of this school.. The hamon style itself is obviously from the Yokoyama Bizen School, There is the “Osaka Style” Yakidashi, found most often on the Shinshinto Tokuden. A beautiful massive katana in the tradition of the Yokoyama Bizen school this sword exemplifies the late Bizen school of the Shinshinto era. As you can see in our photographs the hamon is an active mixture of large choji/gunome with an overall notare shape. There is ara-nie in abundance and hotsure with many hataraki visible. The boshi is a ko-maru with kaen. The hada is a ko-itame with mokume mix and ji-nie appears, a beautiful tight hada to accentuate this robust and powerful hamon. The sword has a great sori and the overall sugata reminds one of the great swords of the Nambokucho Era, a time forgotten. Not to be understated we must describe the beautifully massive koshirae of this sword. The Samurai who ordered this blade as stated on the nakago must have been a tremendously sized man. The tsuka alone is almost 17″ at 16 3/4″. The tsuka and fittings were original to the blade and is mounted as a true Samurai would carry. Not meant to be flashy but a testament to the seriousness that was meant to the Samurai who owned this. The Tsuka-ito is a tannish gold old silk (Note that it is original and not new) with a pair of Bow and Quiver menuki another accoutrement that was preferred by Samurai. The Fuchi / Kashira are of plain iron as well as the 4 lobed Mimi tsuba, this blade and mounts were in the best Samurai style and clearly made as serious weapon. The tsuba is solid and thick and of iron. 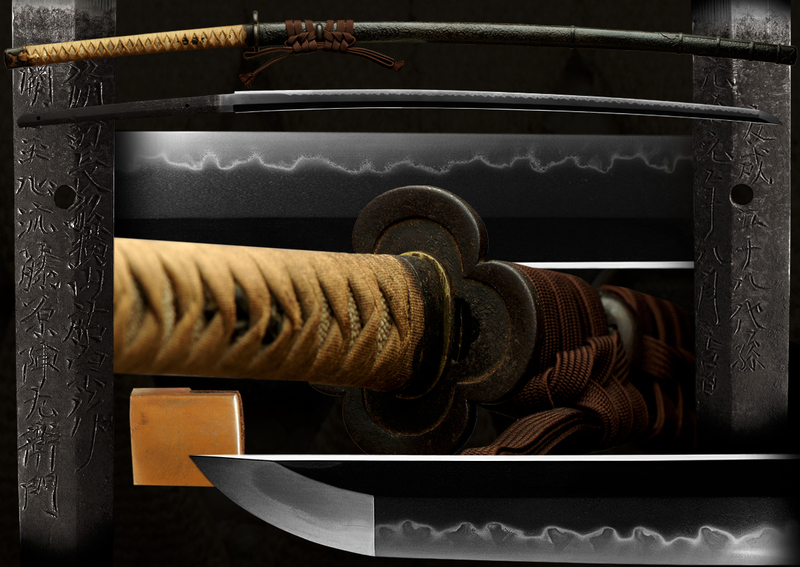 The handachi style mountings on the saya are of course original and the match to the rest of the blade. The saya at almost 37″ is 36 3/4″ and is finished in the large patterned Ishime style lacquer of stone texture in a dark brown patina with a brown sageo. A one of a kind Yokoyama Bizen blade of massive proportions with an almost 34 inch cutting edge, as well as Koshirae and papers. Swords such as these are extremely rare and only come available occasionally. Blades with this kind of provenance that pinpoints the Samurai who ordered it is a dream to many collectors. This blade is a must have for one who yearns for a huge flawless piece with the special mountings of a true Samurai. 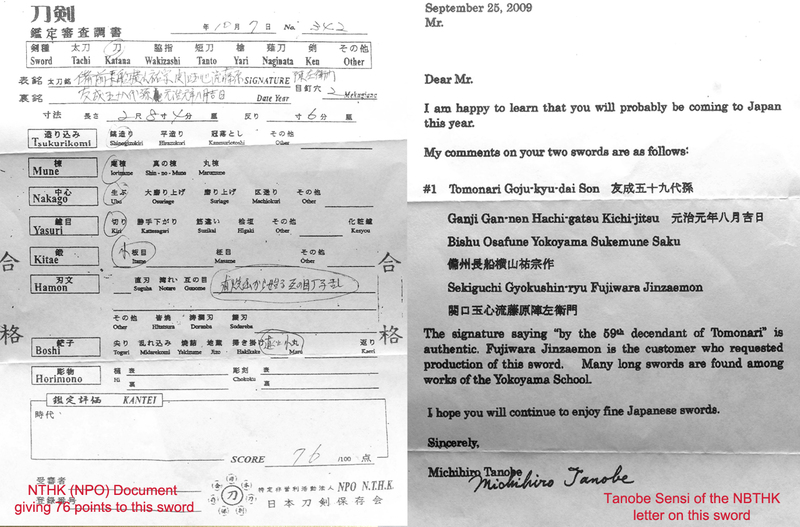 There is a letter with comments by Tanabe included also to add to the provenance of this blade. As dated this sword was made during the same time period as the American Civil War. Email us if your interested in this item and remember to include the order number for this item: fss-732.